. 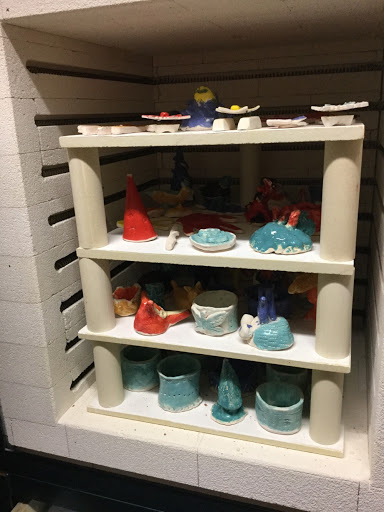 Pally Palette: Cracking the kiln! I was excited to get to school today to crack open the kiln. Nothing has exploded! Always a good thing and one of those unpredictable things that can happen with ceramics, even when you follow all the right techniques. The yr 3/4 and yr4 classes created pinch pot 'wild things' We watched a very expressive YouTube reading of Maurice Sendak's Where the Wild Things Are. We observed the patterns and textures on the bodies of the wild things and recorded them and created some of our own ideas in our visual diaries. Next we had a game or two of Exquisite Corpse - a fun drawing game developed by the Surrealist artists ( think Salvador Dali and his friends) these games helped us to come up with ideas for some drawings of wild things. After exploring these ideas we had a look at the work of a contemporary Australian ceramicist, Vipoo. He creates some interesting characters. 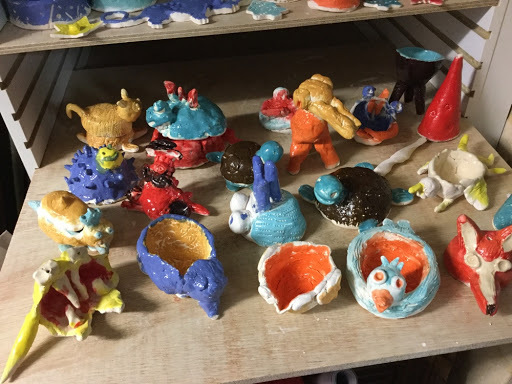 Finally once we had looked at all these ideas the kids got to create their own ceramic " wild thing'. The yr 4's had to have a pinch pot as part of their construction and had to demonstrate that they could join two pieces of clay using the correct technique. The surface of their work had to have textures applied. Year threes were able to create a model of a wild thing that if they didn't make too thick I would fire or they could choose to paint as is. Many of them chose to follow the year 4 outline although this was not expected to demonstrate a satisfactory grade level for them. Last week room 1 got to glaze their pieces. 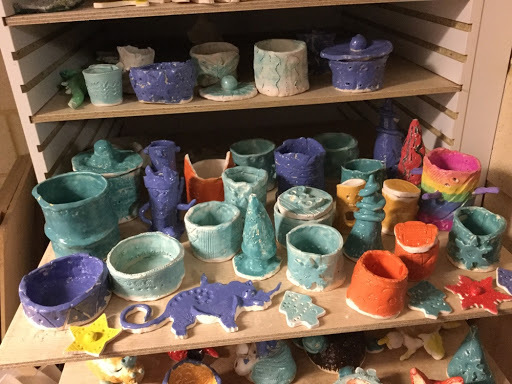 They had to be really really careful as I am rushing them through the kiln because we are so close to the end of the year and there's quite a few to get to. The once fire method means applying glaze to green ware which has not been bisque fired. They are very fragile at this stage but the yr 3/4 class managed quite well. The paper clay I've given them can be moistened and reattached sometimes (if your work is not too thin) and a couple of models I has success with 'gluing' them back together with glaze. The year 6 classes had a bonus clay day because I had left over clay from the yr 4s. Their outline required them to create something rolled and textured. They could join the rolled pieces to create a cylindrical or conical form. It had to be done properly - joined with slip, surface decorated and not rolled too thin in order for me to fire it. This was clearly communicated to the children and most of them followed the outline. Once their models were dry most kids glazed their work but some opted to paint theirs with water colour paint and varnish them rather than fire them. Today the studio will be busy with glazing again with two more classes trying to get as many glazed as possible for the next kiln load which takes about two days to reach temperature, fire the clay then slowly cool so that the pieces don't crack when you open the door letting cool air in.